CORTADORA AUTOPROPULSADA SIN ESCOBILLAS DE 20" Y 40 V está calificado 4.7 de 5 por 1443. Calificado 5 de 5 por sjwexler52 de Best Lawn Mower I've Ever Owned I recently purchased this lawn mower because my old gas powered mower finally fell apart. My first inclination was to start going green and think about an Electric mower. I was immediately surprised by the power offer by the 40V. It's very smooth low noise ratio, and the self-propelled motor makes my job almost effortless. I did purchase a second battery to guarantee I could finish my entire lawn. And that really paid off. I have a little more than a .5 acre so this arrangement worked out fine. I would highly recommend this product and with a 5 year mower warranty you can't go wrong! Kudos to Ryobi for making such a great product! Calificado 3 de 5 por butch6464zz de I like it, but it is not as powerful as a gas mowe I have used it twice on an 13,000 sq foot lawn. It did a good job of cutting the lawn. It took two 40v 5AH batteries to do the lawn. Both batteries were completely dead at the end of the job. I had to restart the mower about 6 times (Easy to do). I am keeping it because of not having to use gasoline or oil and the medium noise. I would only buy this lawn mower for a flat lawn surface and for no lawn over 7 thousand square feet per battery, unless you can wait between charges. This is no way close to gasoline power, but it is much better on the ears and lungs. I recommend it with reservations. Calificado 5 de 5 por JReview de A device done right! I bought this mower about 2 months ago. I've really put it through the test by mowing 2 different homes, I was quite impressed with it's performance, endurance and portability. 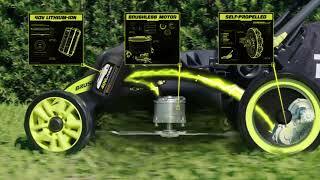 A well engineered product with ergonomics in mind, the warranty on the battery and the mower are second to none. 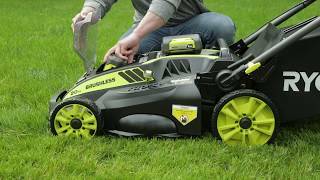 After using this mower, I could never go back to a gasoline powered device. The 5Ah battery is more than adequate for me to do the front and the back yard with a little bit of power to spare. Charging time is also excellent! I've always used the mulching blade and it does an excellent job, self propel is awesome. Remember once you use this mower you are going to love it! Calificado 5 de 5 por CRDoug de Makes trim work a breeze! Trim and touchup work is so much simpler than it was with my old gas mower and the very steep hill in my front yard ( which is not fully walkable) is now no big deal due to the light weight of the Ryobi 40Volt. The 5AH battery is a perfect match and allows me mow the front hill and do all the trim work on my 300' lot "TWICE" between charges. The mower has the power to cut through all of my lawn without a problem. 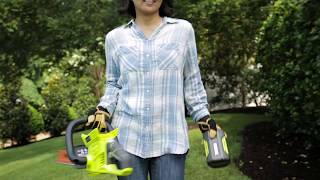 I also have a Ryobi 40V blower and a Ryobi 40V trimmer and am very happy with each of them. In fact I bought my Son a 40V trimmer this spring and he just bought a Ryobi 40volt mower this summer. That kind of tells you how pleased we are with Ryobi. Calificado 5 de 5 por NISSAN de A 73 YEAR OLD MAN'S OPINION I RECEIVED MY MOWER A WEEK AGO FREE SHIPPED BY HOME DEPOT THRU UPS. EVERYTHING WAS THERE AND IN GREAT SHAPE. IT WAS READY TO USE OUT OF THE BOX. I USED THE GRASS CATCHER THE FIRST TIME I MOWED AND IT DID GREAT. IT'S EASY TO START,EASY TO ADJUST THE HEIGHT AND THE SELF PROPEL SPEED ADJUSTMENTS WORKED JUST FINE. IT ALSO COMES WITH SEPERATE MULCHING BLADE. AFTER MY FIRST USE I HAD 25% LEFT ON THE BATTERY.THE BATTERY TAKES 2 TO 3 HOURS TO RECHARGE.I COULDN'T BE HAPPIER WITH THIS PRODUCT.I RECCOMEND THIS PRODUCT TO ANYONE WITH A SMALL TO MEDIUM SIZE YARD. SAY GOODBYE TO TUNEUPS, GAS AND OIL AND THE IRRITATION,WHEN YOUR GAS MOWER WON'T START AFTER 15 TO 20 PULLS!! Calificado 5 de 5 por Spencer M de Shocking Results! I was skeptical about using an electric mower after using Gas for so long. 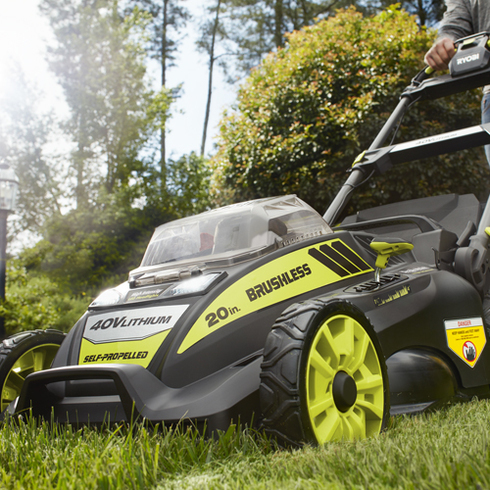 This thing is the perfect replacement for that heavy gas lawn mower sitting in your garage. No more yanking the rip cord until she finally kicks up. This Ryobi push button start makes things so easy. Easy to raise and lower the blade. The charge held for both front yard and back yard. I clicked the button on the battery after finishing and still had a half charge left! This thing is larger and looks like a tank (in a good way) but is still way way lighter than my old gas mower. The handle folding down is a huge plus too as i can store it on a shelf in my garage. Anyways, if you don't believe me check out how good of a job this mower did on my front yard! Thanks Ryobi for a great product! Calificado 5 de 5 por Charlie___ de Great product! it is a good solid lawnmower. Follow the instructions to use the battery properly, it is very expensive to replace. So far, I used it for 3 mowing, doing back and front yard with one charge. The bad things are that the grass has to be dry and the lowest setting is only one and a half inch. But many good things, is quiet, powerful, easy to adjust, has front lights, good security measures.It generate more power when the grass is dense. It has an attachment for mulching. The bag is good size. Self propelled makes it easier to use, 40 V is more than I need for a small yard. It is as good as the gas ones. I love the fact that you can storage in vertical position. Visite la página interactiva para más información sobre esta cortadora. 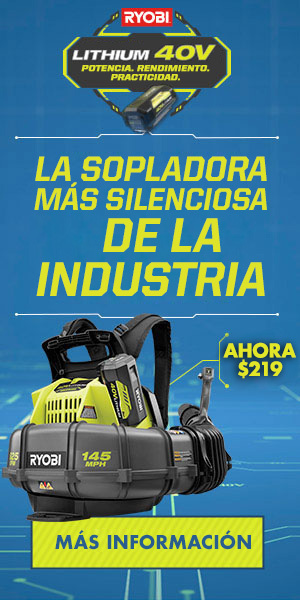 Ryobi continúa innovando y redefiniendo la cortadora de césped inalámbrica con la cortadora eléctrica autopropulsada, sin cable ni escobillas, iones de litio de 20" y 40 V. Esta cortadora autopropulsada presenta tracción en las ruedas traseras para lograr un mejor rendimiento en las subidas y para que sea más fácil cortar en líneas rectas. Esta cortadora ofrece una potencia similar a las cortadoras de GASOLINA gracias su motor inteligente sin escobillas con sensor de carga, que le permite detectar y entregar la potencia necesaria para mantener una velocidad de corte óptima, maximizar la potencia y el tiempo de funcionamiento. Equipada con una plataforma grande de 20" y la opción de 2 en 1 para triturar o embolsar, podrá completar el trabajo rápidamente y a su manera. Esta cortadora también incluye características prácticas y fáciles de usar que la convierten en la opción perfecta para cualquier usuario. Con un arranque sencillo y un ajuste de altura de 7 posiciones, comenzará a cortar en segundos sin depender de gasolina ni aceite. Manijas telescópicas ajustables para seleccionar la altura perfecta y así maximizar el confort y reducir la fatiga. Esta cortadora trae perillas de rápida liberación y está diseñada para guardarla en forma vertical facilitando un almacenamiento compacto. Está equipada con una batería de iones de litio de 5 V y 0.40 A de alta capacidad para mayor tiempo de funcionamiento. La batería y el cargador incluidos son compatibles con cualquiera de las herramientas de 40 V de RYOBI. Con el respaldo de una garantía por 5 años. Tamaño de la cubierta: 20"
Altura de corte: 1.5 - 4"
Tamaño de la rueda trasera: 10"
Tamaño de la rueda delantera: 8"
Tolva de descarga lateral para cortadora de 20"